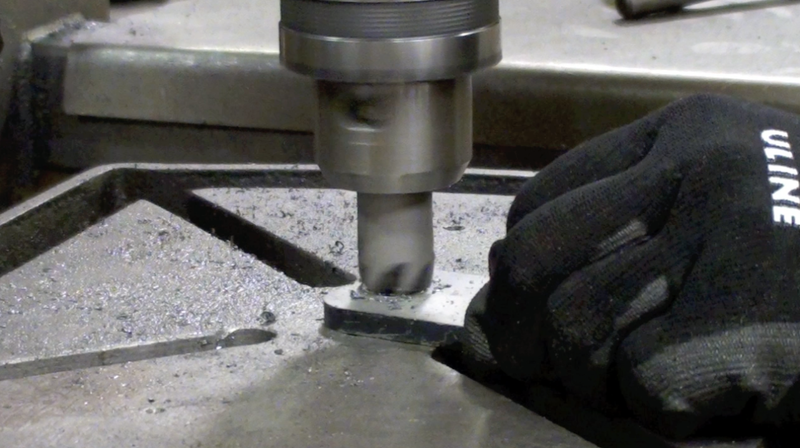 Lasernut is offers an array of counter sinking services from debarring hole to machining relief for flat head screws. A countersink is a conical hole cut into a manufactured object, or the cutter used to cut such a hole. A common use is to allow the head of a countersunk bolt or screw, when placed in the hole, to sit flush with or below the surface of the surrounding material (by comparison, a counterbore makes a flat-bottomed hole that might be used with a socket-head capscrew). A countersink may also be used to remove the burr left from a drilling or tapping operation thereby improving the finish of the product and removing any hazardous sharp edges. The basic geometry of a countersink (cutter) inherently can be applied to the plunging applications described above (axial feed only) and also to other milling applications (sideways traversal). Therefore, countersinks overlap in form, function, and sometimes name with chamfering endmills (endmills with angled tips). Regardless of the name given to the cutter, the surface being generated may be a conical chamfer (plunging applications) or a beveled corner for the intersection of two planes (traversing applications). Form countersinking, also known as dimpling, is a countersink that is formed into sheet metal to increase the strength of a structure as the countersinks of multiple pieces nest together. There are two processes for producing formed countersinks: coin dimpling and modified radius dimpling. Such dimples in fairly thick sheet can even be tapped to yield a threaded hardpoint on the sheet without the bother and expense of welding a nut to the sheet. This style of construction is often seen in modern household appliance design, because it allows the product to be lower-priced, and the quality can still be good as long as the sheet is thick enough.